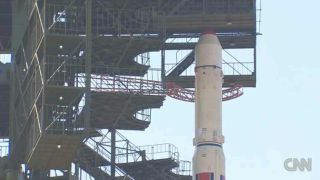 This still from a CNN broadcast shows a close-up of the nose cone atop North Korea's Unha-3 rocket, which country officials say will launch a satellite into orbit in April 2012. North Korea probably tested a long-range rocket in late August, new reports suggest. Analysis of satellite images taken of the country's Sohae Satellite Launching Station indicate the possibility that the North Korean rocket engine was tested between Aug. 25 and Aug. 30. "This conclusion is based on analysis of imagery from before and after the probable test and a combination of indicators including the presence of a probable rocket stage, a crane necessary to mount and remove the rocket engine and propellant tanks on the test stand, instrumentation used to monitor tests as well as changes in the appearance of vegetation in front of the flame trench (from green to brown) and inside the flame trench located at the stand," officials from 38 North, a program of the US-Korea Institute at SAIS, wrote in a blog post about the possible test. Officials aren't sure what type of rocket was tested although they have some ideas. The rocket stage was about 8.2 feet (2.5 meters) wide and 30 to 33 feet (9 to 10 meters) long, which suggests it was a long-range rocket. It could be the second stage of an Unha-3 — a launch vehicle that delivered a satellite into orbit in December 2012 — or an improved version of the rocket. The 38 North post also speculates that it could be the second or third stage of a larger rocket that might be in development.